"This doesn't look like someone's FIRST comic at all! ", I though as I read it. I wish all first comics looked this good, this crisp, this funny. Có is Gustavo Duarte's very first comic, and it's amazing. I know Gustavo for many years now, and we met in a Caricature event. I was doing caricatures for free at the park for some event, along with my brother and another friend, and when the event asked us to have more people working, our friend brought Gustavo. And boy he was good at doing caricatures. I soon discovered he world as a cartoonist on a sports newspaper and soon I realized not only was he good, he was really into comics. As I followed his blog, I kept seeing various comics related cartoons, some that he used on his work, and some he did out of pleasure. Bá and I, we're stupid. We can't see an itch and we feel this need to scratch it. Somebody can have a very easy going and succesful life, but if we see this person has the "comics itch", we'll go there and scratch it until it grows. Some people want that itch to grow and need an excuse, and we love to be somebody's excuse to do comics. Gustavo wanted to do comics. He might have wanted to do just one comic book. I told him "Go", and I kept telling him every time I saw him. I'm so glad he went. And what an amazing comic he did. This year, in San Diego, I convinced Gustavo to go to the convention and sell his comic there ( I guess this was another excuse he had to do it) and it was awesome to see the response of the public. Có is a funny comic, and there's nothing better than seeing people holding a funny comic and, suddenly, they would start laughing. Comedy must be immediate, and the response should be equally fast, and Gustavo hit all the right notes in his comic. When you finish, it feels great because you did it. When you finish, you can't wait to start the next one. It's addictive. While Gustavo is already planning his next comic, you can look for Có at my favorite online retailer, Khepri.com (click here to get your copy). If you don't live in Brazil, Khepri is your best option to find this comic before it sells out. And then you'll agree with me, and you'll join me as we wait for whatever is next. note: all the images above on this post were drawn by Gustavo. Did you buy any Vertigo Comics this week? Last week? Well, if you did, you saw the Daytripper preview (a different one from the one that went online yesterday) printed inside. But, in case you missed it, along with the preview there was a conversation with Bá and me about the book, and that conversation is now online at the Vertigo blog. Also, the solicitations for February are online and so is our lovely cover for Daytripper 3. "I hate you, you piece of s---!" Those were her last words before she left him. If all we need is love, how do we keep going once we lose it? To find out, Bras' father will take him to the desert and take Bras' best friend to an art show. Also on February, Vertigo will release DMZ #50, and it will be an special issue with several guest artists, including me. That's the story I'm drawing this month along with my regular Daytripper pages, and this issue of DMZ will come out the same day ad the third issue of Daytripper. I have to get back to work. I'm very excited about this series, I'm excited about next year, I'm excited about comics in general, but I really need to lower my head a bit and focus on some pages. Thanks for the support and patience. The wait is almost over. 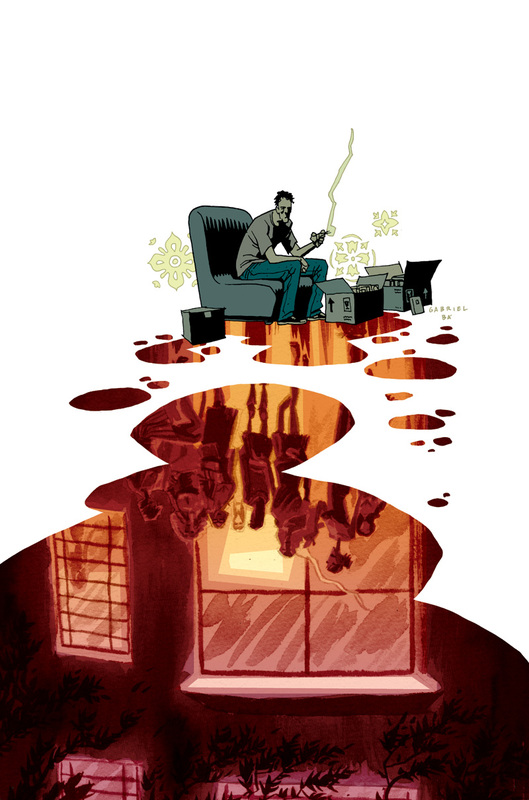 Today, at the Vertigo blog, you can check out an extended preview of the first issue of Daytripper. The cover and the first 8 pages are there for you to enjoy, get a glimpse of our new series, and hopefully they'll leave you craving for more. In October, while visiting our studio, Ivan Brandon read the first 5 issues and said that Daytripper "is one of the most unique and heartbreaking books you'll ever read". I hope more people feel that way. Tonight is tango night. It's always better to tango when you feel you have something to celebrate. As we get closer to the release date of the first issue, I feel every day I should be celebrating. Working at the same time, but still finding some time to celebrate. As I tango, I suppose the internet will provide another treat tonight: the cover for the third issue of Daytripper. I'd keep my eyes open for that one. And to finish this post with something new to show, here's a sketch I did back in August as Bá and I were still figuring out what were we doing for the cover of issue one. Bá came up with the idea of Brás (our main character) sitting in the bench with his dog, Dante (yes, I'm giving away names, but that's because they're all on the preview I linked above), and I started to play with the background image and then Bá took that thought and created the awesome first cover. Friday 13th. Here I am at night, headed home. First, I stop to think about all these things that seem to be happening at the same time. I put aside my X-Men curiosity for a while. It was getting in the way of my pages. It was getting serious in an unhealthy kind of way. When time allows, I'll get back to it as the curiosity is still here, alive and kicking, but there are more urgent matter kicking harder. 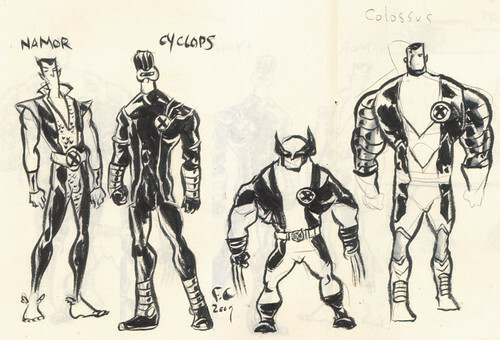 I did, however, managed to do some more sketches of the X-Men. And what trouble did they bring. I can tell you it's not easy to draw those people. But back to what takes most of my time: Daytripper. The release of Daytripper is getting closer and closer. Finally, after more than a year working on it, it's finally happening. We have never been so proud of anything we did like we are of Daytripper, and I think it really shows how much we like this project when we realize how much hard work it requires from us. We do everything the same we did with any other project, but it just seems harder, like it's so much more personal that it hurts to get it done, to get it out. Matt Fraction told us writing Casanova was a lot more trouble than writing anything else, so I guess it's expected. Talking about Matt, he spent the entire week answering all sorts of questions on the WhiteChapel forum, and I found it very interesting for anyone who wants to know more about writing and making comic books for bigger and smaller publishers. I also liked that questions were balanced between his Marvel work and Casanova as it shows that readers are waiting for the book's return. We've been planning the book's return for some time now and it was very nice to see Matt share some information of the hows and whens of it. Everybody should check out that discussion, I couldn't help it myself and made some questions, and I ended up answering some as well. That's how we'll learn: getting out there, making questions, trying things out by ourselves. I have a lot of faith for the future of comics and I welcome all the hard work involved in being a part of this present and this future. I won't be easly scared if things get rough. Not now, on a friday 13th at night, and not ever. Don't you just love comics? I think this is my very first Sandman. Done over my coffe-break. A week ago, I was thinking about Casanova and I read something on Matt's twitter about what he wanted to do someday in a story, and I joked ( on my twitter) he was already doing that on his X-Men. All this silly talking soon turned into a "what if I did draw the X-Men?" that got my corner of the internet talking. Just the day before that, I was talking to Grampá, Rafa and Cobiaco I didn't thought I was a good fit for super heroes just because I wasn't curious to see super heroes in my style. I'm curious to see Grampá drawing them, or Paul Pope, or John Cassaday, or even Bá, but not me. Now you imagine you're crazy like me, and then you mix the conversation with Grampá and the internet cheering, and then my curiosity suddenly grew and looked me in the face, challenging me. I fed this challenging curiosity a few days, researching the current X-Men. I opened the sketchbook during one of my many coffee breaks. I just let my curiosity drive my hand. My hand drew Casanova characters.